I suppose this is the album that kick started British folk rock with A Sailors Life, and what a track, they took folk’s fingers out of its ears and used them to plug-in electric guitars. You can hear the echoes of so much folk rock here, right up to The Unthanks. It’s definitely a British Sound, but there is still shades of West Coast psychedelia, you could almost imagine Jefferson Airplane having a go at this. 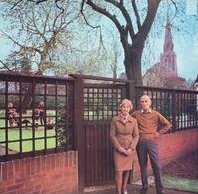 My favourite track on this album is the wonderful trippy Genesis Hall a wonderful and overlooked song. And who could forget everyone’s favourite Fairport track, Who Knows Where the Time Goes. Listened to this tonight while walking through Dublin, made the rain disappear. Kid view: When I was a kid I often wondered how that guy Trad Arr was such a prolific songwriter. This entry was posted in Uncategorized and tagged Fairport Convention. Bookmark the permalink. Ah yes…great album and imho much better collection than L&L which was a bit diddly dee for my tastes… my personal favourite is Percy’s Song – timeless…! Lief is a great album, how can you not resist Matty Groves?